Bob Dylan has been put under the media microscope, bisected, dissected, and trisected for the past six decades, with everyone and their mother trying to interpret the essence behind the enigma. Documentarian D.A. 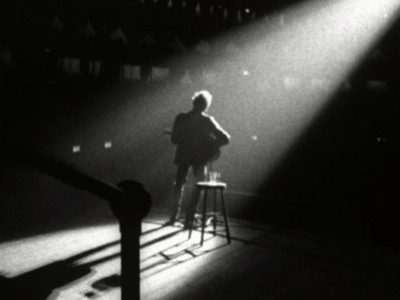 Pennebaker doesn’t go that route in DON”T LOOK BACK; instead, his cinema verite, free form style adheres to the old adage “show, don’t tell”, as he and his camera crew follow the troubadour on his 1965 tour of Great Britain, culminating in his historic set at the Royal Albert Hall. This would be Dylan’s final tour as a solo performer with guitar and harmonica – the album “Bringing It All Back Home” would soon be released, featuring electric and acoustic sides, and later that year he’d plug in with his band and shock the hell out of the crowd at the Newport Folk Festival, who booed him mercilessly and accused him of selling out. Pennebaker, who was later responsible for the seminal rock docs MONTEREY POP and ZIGGY STARDUST & THE SPIDER FROM MARS, opens his film with the shape of things to come, a pre-MTV style video of Dylan’s electric “Subterranean Homesick Blues” (which was already beginning to climb the pop charts). We then go behind the scenes to get a glimpse of the man called variously a poet, folk singer, anarchist, and voice of a generation. Dylan pokes holes at the pretentiousness of the journalists and interviewers on his trail; one wonders where the put-on ends and the truth begins. He’s accompanied by fellow folkie and then-lover Joan Baez, though the couple were in the midst of breaking up at the time, for while Joan was a true believer in causes, Dylan scoffed at such matters, and admits he considers himself “an entertainer”, not a social justice warrior. (He even played with these various interpretations of himself in Sam Peckinpah’s PAT GARRETT & BILLY THE KID , as his character Alias is asked, “Alias what?”. His response: “Alias anything you please”). 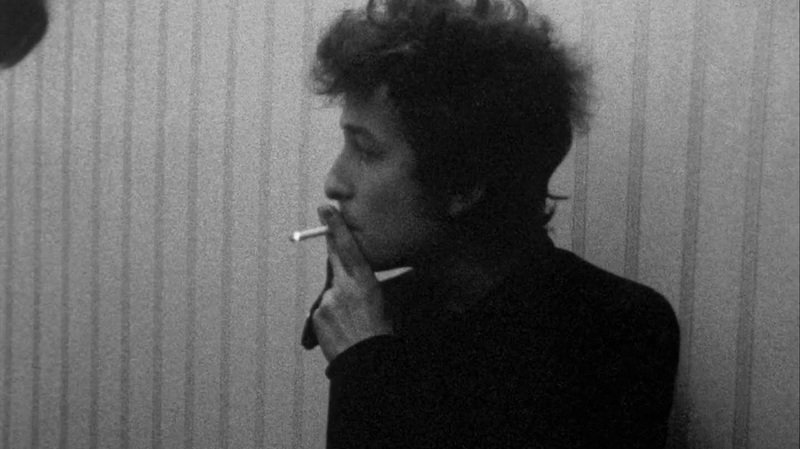 Many 60’s luminaries besides Baez appear in the film, including Beat poet Allen Ginsberg (who appears in the “Subterranean Homesick Blues” proto-video), Alan Price of The Animals, Marianne Faithful, and notably Scottish singer Donovan, whose early career was so obviously modeled after Dylan they could be twins! When they finally meet at a hotel room party, Donovan serenades Bob with the tune “To Sing For You”, after which Dylan tops him with a rendition of “It’s All Over Now, Baby Blue”, Donovan obviously mesmerized by his idol. And yes, there’s plenty of music in the movie; Dylan croons “All I Really Want To Do”, “The Times They Are A-Changing”, “The Lonesome Death of Hattie Carroll”, Hank Williams’ “I’m So Lonesome I Could Cry”, “Don’t Think Twice (It’s Alright)”, “It’s All Right, Ma, I’m Only Bleeding”, and others, both on-and-off stage. Dylan’s manager Albert Grossman is a ubiquitous presence, negotiating TV contracts, and proving what Bob’s been saying all along – he’s just an entertainer, not a standard-bearer for any movement. 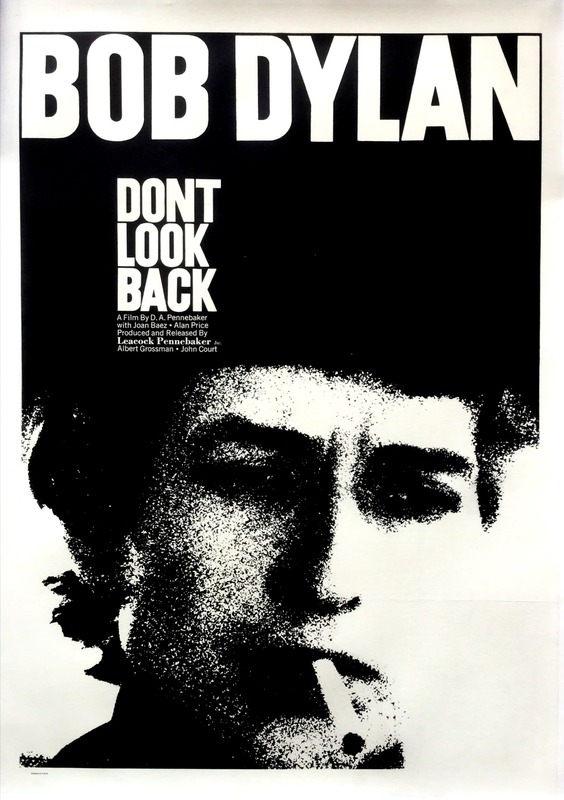 DON’T LOOK BACK allows Bob Dylan to show himself behind the masks, a portrait of a young artist who’s constantly changed and evolved over the years. It’s probably the most honest picture of Dylan we’ll ever get to see, and if you’re a Dylan fanatic like myself, you don’t want to miss it.